The right food and supplements can speed injury recovery. This is important — but often ignored. Most trainers, coaches, nutritionists, therapists understand that nutrition can play a role in injury recovery. However, in lecturing around the world, I’ve found that very few of them really know how to use food and supplements in this way. Aside from recommending more water, topical homeopathic creams and gels, and glucosamine/chondroitin combinations, there’s really not much else on the menu when a client or athlete goes down with an acute injury. That’s why we’re sharing this 5-part video series, filmed live at the 2012 Fit Pro Convention in Loughborough, England. In this video series, we’ll teach you how the body repairs itself after an injury. Then we’ll share the food and supplement protocols we use to get injured clients back in the game more quickly and completely. To learn more, click the play button below to get started with Part 1 of Nutrition for Injury Recovery. (Click here for part 2, part 3, part 4, and part 5). The video is about 8 minutes long. To download an audio or a video version of this file, click here. Please be patient as downloads may take a few minutes. With all the pain, swelling, redness, and dysfunction, injury can seem like a chaotic process. Yet at the physiological level, injury recovery is highly organized and consistent. Regardless of the type of injury, there’s usually damage to muscle, bone, and vascular tissue. When these tissues are injured, they’re deprived of their normal flow of oxygen and nutrient-rich blood. Reduced blood flow, as well as the actual physical damage, leads to cell death. The body then initiates the inflammatory process to clear out the damaged/dead cells and lay down new ones. Inflammation itself is stimulated by the increased movement of inflammatory/immune chemicals (leukocytes, neutrophils, macrophages, phagocytes, etc.) into the injured areas. These chemicals take care of the cellular debris and attract plasma (fluid from the blood) and blood proteins to the site of injury. This biochemical process removes injured tissues and starts the repair process. 1. Pain. This is a function of two things: First, certain chemicals involved in injury repair (substance P, calcitonin, histamines, cytokines) may interact with local pain receptors to cause the pain associated with inflammation. As inflammation proceeds, pain may also result from the swelling/pressure placed on nerve endings. 2. Swelling. This is a result of fluid seeping through damaged — and now hyper-permeable — blood vessels into the damaged tissues. These vessels are typically damaged by the initial trauma. In addition, they’re often altered chemically during the inflammatory process. 3. Redness and heat. Vasodilation up-stream of the injury and constriction downstream shunts additional blood to the injured area, producing heat and redness. The upstream vasodilation is thought to be related to nitric oxide activity. Although painful and irritating, we need the inflammatory process for repair. Without inflammation, injuries wouldn’t heal. So any attempt to eliminate inflammation is a mistake in the initial stages of an acute injury. Excessive inflammation, especially if it’s prolonged, can lead to other problems, such as continued macrophage activity at the site of inflammation and ongoing tissue destruction. This is why inflammation management is an important concept in injury recovery. It’s also why anti-inflammatory drugs are often prescribed by physicians during chronic pain. Once the inflammation of stage 1 begins to subside, most of the damaged tissues will have been removed from the site of injury, and new vasculature will have developed. Importantly, scar tissue will lay down in alignment with the forces being placed on the area. (That’s why rehab and therapy is so important.) Further, this scar tissue will contract and shorten as it matures. This is due to fibroblast differentiation into myoblasts, which are similar to smooth muscle cells. This reduces the size of the injury. Eventually, the scar tissue (typically made up of type II collagen) will be degraded and type I collagen (much stronger) will be laid down in its place. Although this new tissue will never likely be 100% normal, it can become about 80% as strong as uninjured tissue. Since this tissue is created along tension lines, functional activity (rehab and therapy) is critical throughout the recovery process, as it helps to maintain the length of the scar tissue. It’ll also help arrange the tissue in an organized pattern, in line with adjacent soft tissue fibers. This predictable pattern of soft tissue healing can give us clues about how to manage injuries through the use of physical therapy, manual therapy, nutritional strategies, and drug interventions. Bone healing undergoes a similar, yet unique, process when compared to soft tissure repair. Bleeding from the fractured bone and surrounding tissue causes the fractured area to swell. This is similar to the inflammation phase experienced in soft tissue injury. At this point, the pain and swelling will decrease. The site of the fracture will stiffen, with new bone forming. New bone is weaker than uninjured bone. It’s also incomplete and, therefore, cannot be seen on x-rays. During this phase, new bone begins to bridge the fracture, covering the incomplete soft callus. This bony bridge can be seen on x-rays. The fracture site remodels itself, correcting any deformities that may remain as a result of the injury. This final stage of fracture healing can last up to several years. Like soft tissue injuries, bone injuries go through an early inflammation phase. This attracts plasma and inflammatory cells to the site of injury. These cells help to clear out the damaged tissue and revascularize the area. After this occurs, other cells (in this case, periosteal cells) proliferate and differentiate into chondroblasts and osteoblasts to form new tissue (cartilage and woven bone). This eventually forms the callus. As with soft tissue injury, this early tissue is eventually replaced again. This time, the cartilage and woven bone forms lamellar bone after a collagen matrix becomes mineralized. Over time, lamellar bone becomes trabecular bone, which is nearly as strong as the original bone. During the last phase, this trabecular bone is resorbed and compact bone takes its place. This compact bone closely duplicates the original bone’s shape and strength. 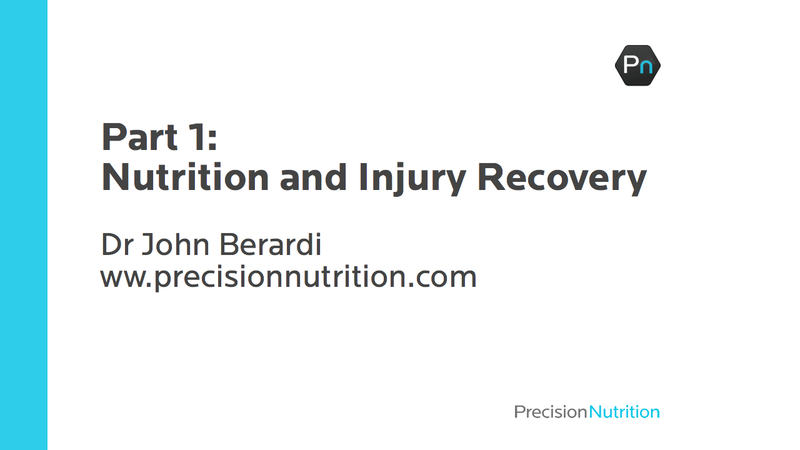 That’s it for part 1 of Nutrition for Injury. For now, here are some key points. Yes, the science can get heavy at times. But you don’t need to memorize it all. Instead, simply remember that injury recovery follows a highly organized and predictable pattern. In both soft tissue and bone recovery, inflammation is the first step in the process of clearing away damaged cells. After that, recovery is all about building up new, functionally equivalent connective tissue and/or bone. As we explore the recovery process, look for targets where therapy, nutrition, and supplementation can play a role. In part 2 of the video series, we’ll talk about these targets and how nutrition can help. In it you’ll learn the best eating, exercise, and lifestyle strategies — unique and personal — for you.